The king of the jungle spends his days in many ways. Primary activities include hunting, eating, protecting territory, mating, establishing pack leadership and caring for the young. Male and female lions have different responsiblities. Males aim to establish and maintain dominance and father cubs. Females provide for and protect pride members. Female lions, who make up 75 percent of the pride, are responsible for most of the hunting. Hunting usually takes place between evening and early morning. Antelopes, buffalo, impalas, zebras, wild hogs and wildebeest are common prey animals for African lions. The females work cooperatively to bring down prey. Lions can also hunt individually, bringing down small game like birds, rabbits and reptiles. After the hard work of bringing down an animal is completed, the lions feast. Cubs are often left with the scraps after the adult lions have finished eating. Because only about one third of hunts are successful, lions may go days without a meal. Lions may also steal prey from other animals, like hyenas and wild dogs. The lions roar and swipe at the defending animals, who would rather forfeit their kill than become the lions' next dinner. From morning to late afternoon, when the African sun is hot to the point of unbearable, lions can be found lounging and relaxing. Lions may rest about 20 hours a day. In late afternoon to early evening the lions rouse themselves and engage in social behavors. Pride members show affection by rubbing their heads on one another, licking each other's faces, grooming each other and purring. The lion equivalent of a handshake is to rub heads and curl their tails together while moaning quietly. Lions have even been known to roar in chorus as a form of social communication. Male lions are responsible for ensuring their territory remains their own. They go to great lengths to mark their parcel of land, which can be up to 100 square miles. Male lions will urinate to mark their scent and leave scuff marks as a visual cue to other lions that they're intruding on another pride's territory. They roar to intimidate others and chase any intruders off their turf. Among African lions, being the pride leader means earning the right to mate. 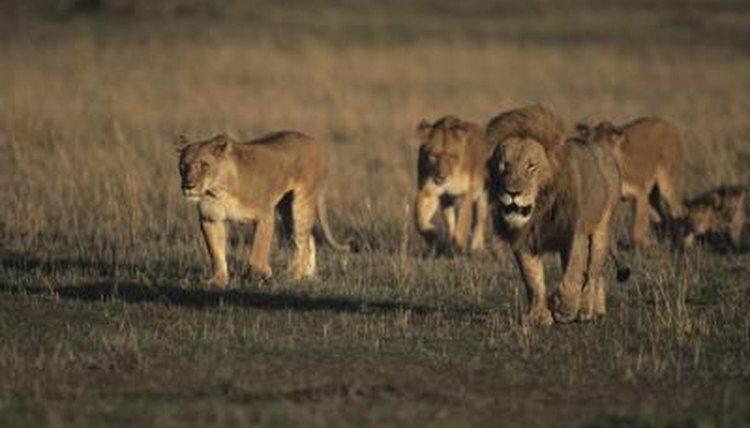 Each pride consists of one to three males who mate with females in the pride throughout the year. When young male lions reach the age of 2, pride leaders see them as a threat and drive them away. Young males, often brothers, form coalitions and live on their own for about two years. Then it's time to claim a pride of their own, by taking over an existing pride. When a coalition challenges existing pride leaders, the lions fight until a winner is determined. Often this is a battle to the death. The victorious males usually kill any nursing cubs fathered by the losing lions, allowing the females to become pregnant sooner. Normally, a female lion won't get pregnant until two years after her most recent cubs were born. When lionesses in a pride give birth synchronically, the cubs enjoy a higher survival rate and the mothers work together to raise each other's offspring. Mother lions nurse the newborns for the first seven to ten months after birth. The mother lion keeps her babies hidden for the first two months of their lives. Cubs are dependent on their mothers and other pride members until they're at least 16 months old. Mother lions aggressively protect cubs during a pride takeover and are sometimes killed while trying to shield their young from attacking males.